I'm so excited to be the guest designer for Hallmark Scrapbook. Here is a link to their blog and don't forget to check out their online store HERE. Thanks for the info on the website, I'll have to check them out. Cute card, Simple but Pretty. Nice card, glad your back creating, hope your craft sale went well. 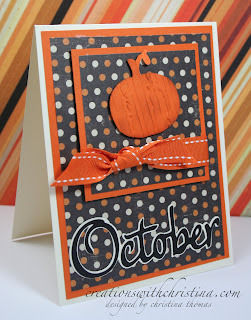 I love the simplicity of this card and it looks fabulous! The alphabet is really neat. Wasn't interested in this cartridge until I saw your October. Congrats on your designer spot and I'm looking forward to hearing about how your craft fair went. Thanks, Christina! Darling card! Have not seen the video yet. Congrats on your guest spot!!! YA!!! your back with a video, I was going through withdrawls, cute card, congrats on the guest spot, how was the craft fair? Super card Christina.....Congrats on the guest spot ~ how awesome! Cute card. Thanks for sharing your time and talent. Congrats on your DT w/ hallmark, wtg! Great card! Love your videos, keep them coming! Thanks so much for doing a GD spot for us! We LOVE your work. You give us so much great information and your videos are great. Some of us are visual learners and it's so great to be able to SEE it being done! THANKS again Christina!